That defence has already found its way into domestic U.S. politics. A possible contender for the Democratic nomination for president, Sen. Elizabeth Warren, defended her vote for more military aid for Israel during the Israeli assault on Gaza by citing the rocket launch defence. But although some Hamas rockets were launched near homes or other civilian structures, military developments on both sides have rendered that defence of Israeli attacks on civilian targets invalid. The rocket launchers for Hamas’s homemade Qassam missiles consist of simple tripods that can be removed in seconds, and the extensive Hamas tunnel network has given it underground launching sites as well as storage facilities for its larger, longer-range Grad and M-75 missiles. A video released by the Israel Defense Forces (IDF) in a report on Hamas’s “illegal use of civilian infrastructure” last month shows an attack – obviously by an Israeli drone — on an underground rocket launcher only a few metres away from a mosque causing no damage whatever to the mosque. The IDF sought in mid-July to use the rocket launcher defence to explain the damage to Al Wafa Rehabilitation and Geriatic Hospital in eastern Gaza City from 15 rockets, which forced the staff to evacuate its patients. An IDF spokesman said the military had “no choice” because rockets had been launched from very near the hospital. Clearly revealing that the rocket launch justification for the attack was a ruse, however, the spokesman revealed to Allison Degler of Mondoweiss that the alleged launch site was 100 metres from the hospital. That would have been far more space than was needed to strike the launch site without any damage to the hospital whatever. A report released by the IDF August 19 included an aerial view of Al Wafa Hospital with two alleged rocket launching sites marked at locations that appeared to be much farther from the hospital than the 100 metres claimed by the IDF spokesman. When the IDF destroyed Al Wafa hospital completely by airstrikes on July 23, it abandoned the pretense that the reason was a Hamas rocket launch site. Instead it released a video purporting to show firing at IDF troops from the hospital. It turned out, however, the video clips of the firing had been shot during Operation Cast Lead in 2009, not in 2014. The IDF has continued to suggest that its destruction of public civilian facilities was forced on it by rocket launches from within those facilities. At the end of the Operation Protective Edge the IDF spokesman’s office claimed that 597 rockets had been launched from civilian facilities, of which 160 were allegedly fired from schools, 50 from hospitals, and 160 from mosques. But those figures were produced only by pretending that launching sites some distance from the facilities in question were on the premises of the facilities. An IDF “declassified report” released August 19, aimed at showing that civilian facilities were serving as military infrastructure for Hamas, includes no evidence of any rocket launches on the grounds of any civilian facility. Careful viewing of the footage reveals, however, that the apparent launch comes from outside the wall of the three-story school building rather than from within it. In three other cases of alleged rocket launches from schools, the IDF provides no visual evidence – only large red dots drawn on an aerial view of the schools. During the Operation Protective Edge, the IDF openly targeted mosques, claiming they are military targets, demolishing 73 mosques and partially destroying 205 more. The August 19 IDF report refers to a “rocket cache and gathering point for militants hidden in a mosque” in Nuseirat. But despite frequent repetitions of the notion that Hamas routinely stores rockets in mosques, the IDF has not produced photographic evidence of rocket storage in a single mosque. 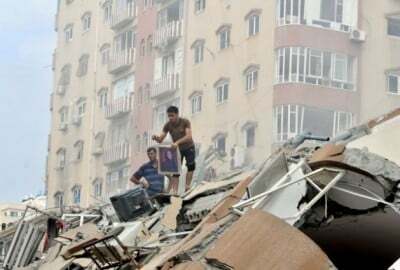 The most extensive destruction of civilian structures in Operation Protective Edge was the complete leveling of large parts of entire neighbourhoods in the Shujaiya district of Gaza City on July 19. After the United Nations published a map showing the complete destruction of those areas of Shujaiya, the IDF published its own map on August 4 aimed at justifying the destruction. The map shows that the IDF can’t claim the proximity of Hamas rocket launching sites as the justification for the leveling of many residential blocks in Shujaiya. The Israeli military had identified every home in the devastated neighbourhoods on its map as a “hideout” for Hamas or Islamic Jihad fighters. An account of the Shujaiya destruction by journalist Mark Perry based on a July 21 U.S. Defence Department report recalls that the IDF fired 7,000 artillery shells at residential areas in the district the night of July 19, including 4,500 shells in the space of just seven minutes. Gareth Porter, an investigative historian and journalist specialising in U.S. national security policy, received the UK-based Gellhorn Prize for journalism for 2011 for articles on the U.S. war in Afghanistan. His new book, Manufactured Crisis: The Untold Story of the Iran Nuclear Scare, was published February 14, 2014.